(BECKET, Mass.) – Dorrance Dance teamed with Toshi Reagon and her band, BIGLovely, last week on the mainstage at Jacob’s Pillow Dance Festival for an exciting, dynamic program that was equal parts rock concert, live music video, jazz arts, exploration of the diversity of the blues, and, yes, an ecstatic celebration of dance through the form of contemporary tap. 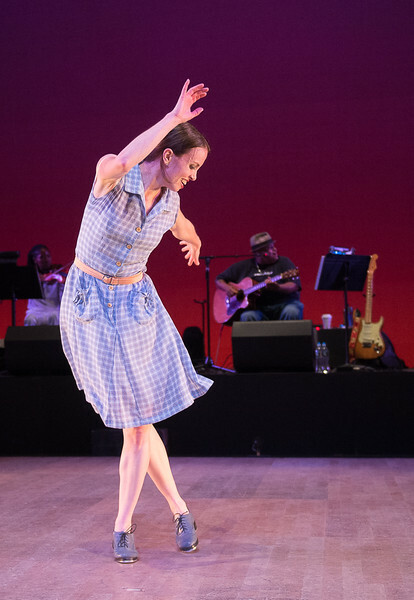 This was not Fred Astaire, nor was it Broadway, although Michelle Dorrance’s rich vocabulary has elements of both as well as her own dazzling take on tap’s possibilities. Mostly, Dorrance seems wholly to ignore the fact that the dancers are tapping, and rather, she choreographs modern dance that utilizes the tools of tap to enrich the musical and rhythmic effects of the dance. And with the addition of Toshi Reagon’s omnivorous interpretation of blues – from spirituals to field hollers to country blues to electric blues to jazz to blues-rock to funk and beyond – and her musicians’ virtuosity in all these styles, the dance-music program was an unforgettable, almost cinematic spectacle. One could have read it as the history of the blues, and/or the history of the African-American saga in all its triumphs and tribulations (especially in light of recent events), but one also could easily just have been dazzled by what a great work of American art and entertainment the two geniuses put together. Of course they couldn’t have pulled it off without their stellar dancers and musicians. Dorrance Dance boasts a veritable United Nations of dancers in all shapes, shades, and sizes, united in their athleticism and sheer joy of expression – as well as their commanding technique. Standouts on Saturday night included Dormeshia Sumbry-Edwards (who along with Derick K. Grant and Dorrance is co-credited with choreographing the evening-length work), who in tandem with BIGLovely drummer Allison Miller, engaged in a dance-percussion jazz cutting contest, with the two tossing back and forth rhythmic calls and responses and challenges that seemed impossible to meet yet kept on going until they worked each other into a frenzy. The dancers overflowed with humor and personality in various combinations of folk dances, two-steps, and ensemble pieces, the best of which included Michelle Dorrance herself, who seemingly impossibly outshone everyone else onstage with her stunning presence marked by intensity of power and precision. Dorrance dances with every muscle, bone, and nerve in her body, and her eyes communicated as much as her feet. She’s a superstar on the level of a Kareem Abdul-Jabbar or a Miles Davis or a Pablo Picasso — one could easily hope for an entire evening of nothing else but seeing Michelle Dorrance exhibit her magical spirit and inspirational, evocative technique.